As winter has shortened daylight time in BC, most of us drive, bike or walk to work when it is still dark and return home when the sun has already set. Being on the road in this season is not simply inconvenient, very often it is dangerous. Nearly half (43 per cent) of all traffic accidents involving pedestrians in B.C. happen between October and January. As many as 63 pedestrians died and over 2,600 were injured in traffic incidents in B.C. in 2016 (the latest year for which ICBC posted official stats). The number of homicide victims in the province in the same year was just slightly higher, 87 people. What makes it worse is that in B.C., 69 per cent of crashes involving pedestrians happen at intersections. Traffic safety experts acknowledge that even when drivers proceed with caution, it’s hard to see pedestrians in poor visibility. That is why ICBC has started distributing free pedestrian reflectors as part of their annual safety campaign. 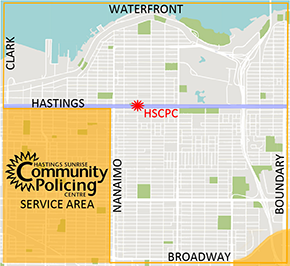 Hastings Sunrise Community Policing Centre is one of the places in Vancouver where anyone can pick up a reflector and learn useful road safety tips. ◆ And definitely not to jaywalk. ◆ To remember, if a vehicle is stopped in front of your car or in the lane next to you, it may be yielding to a pedestrian. Through ICBC’s road improvement program, over 100 pedestrian and cyclist safety projects were completed in 2017, including sidewalks, countdown timers and pedestrian activated flashing crosswalks. But in the end, our safety depends on us. Rushing through an intersection on yellow or red light can put people’s lives at risk as much as running towards a crosswalk when countdown timers are showing the last few seconds of green.